Many home owners are installing new cabinets in their homes as a DIY home improvement project. 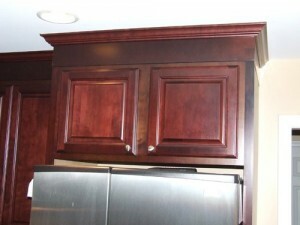 You can add elegance to stock and semi-custom cabinet lines by adding a few simple details. Almost all semi-custom cabinet lines come with a very generous selection of matching moldings. When I designed our new kitchen the one thing that was most important to me next to a great layout was the use of moldings to give the cabinets a sense of elegance. Many of the people that visit our new home comment on the beautiful custom cabinets. I have to chuckle each time as I explain that the cabinets are Kraftmaid and anyone can buy them for a reasonable price. In fact, I’m convinced that almost 95% of all kitchens can use the semi-custom line that most manufacturers offer. It’s really a matter of some vision and creative design that allows you to give it the custom look. Crown Molding – Crown molding is an obvious choice but I see more and more kitchens now without it. Part of the lack of crown molding is a reflection of current “minimalist” designs. But most of it actually comes down to people being afraid to install crown molding. The fact is with some practice most intermediate DIY folks can install crown molding. 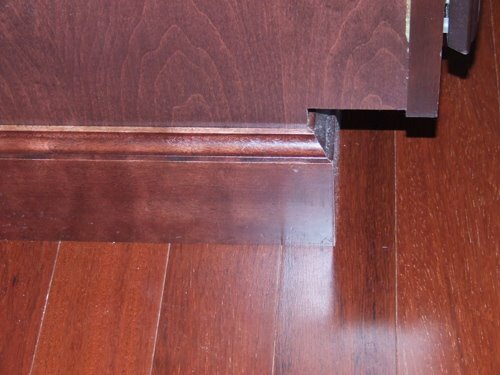 You’ll need a miter saw and some patience for this detail. Decorative Baseboard – 90% of stock kitchens are sold with the shitiest worst baseboard known to man. The standard baseboard is 1/4″ thick plywood with one finished face. This stuff is aweful and for the price you’re paying for cabinets it shouldn’t even cross your mind to buy it. Instead, almost all cabinet manufacturers offer several great options. You can order solid 3/4″ thick stock material (typically 3″, 6″ and 9″ wide) or you can upgrade to a cove base shown in the photo. The added detail gives your cabinets a definite furniture quality that the thin junk just can’t achieve. Light Rails – Adding a light rail to the bottom of the upper cabinets is another simple detail that helps set standard stock cabinets apart from a custom look. There are tons of styles to choose from, in the adjacent photo I used a very simple flat stock molding with a simple routed edge. The light rail serves two purposes, obviously they look good but they also help you hide any under cabinet lighting you have. All of these moldings come pre-finished to match the cabinets. Care should be taken to make neat cuts and tight joints. Most cabinet manufacturers supply some type of stain stick/marker for touch-ups. You can use that stain marker to stain the cut edges prior to assembly. So next time you’re ordering cabinets for your big home improvement project make sure you ask the sales person about the selection of decorative moldings available. You’ll be glad you did and everyone will think you bought much higher quality cabinets. Thanks again for the tips, will have to remember this when we build. I think the kitchen and master bed/bath are the most important parts of the home (maybe I am selfish) and cabinets are high on the list. 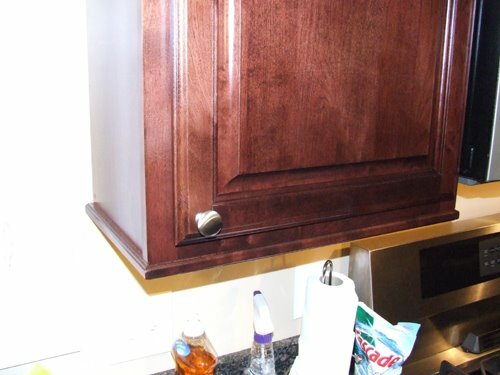 The main reason cabinets get installed without moldings is simply lack of awareness of all the options. You have done a good deed letting people know that moldings can easily be added. 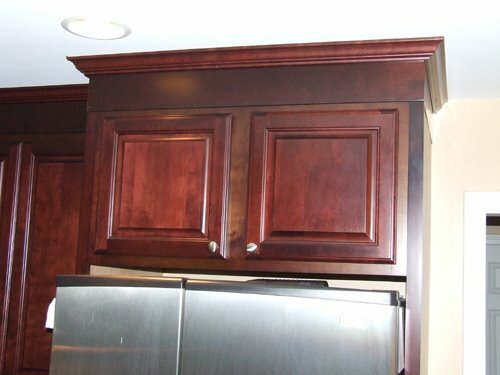 Those who did not add them when they installed new cabinets or are happy with their existing cabinets will be happy to know that you can add baseboard and cabinet crown molding any time. It is also possible to have existing moldings matched no matter how old or rare. We have the identical color cabinets as your advertisement and of course did not know that we could have ordered the “light rails” when we had the home built. Is it possible that if we sent you the measurements, you could pre-cut the rails and send them to us??? Tonza – We don’t sell anything, this is just an informational website.